-[CHANGE] -Client detail dialogs show the Mod version too. -[ADD] -Web Interface Account Management from ionix (WebTemplate included in package). -[ADD] -Web Interface Cookie Settings from ionix. -[FIXED] -Bug on small file push. -[FIXED] -Argos Column bug when enable/disable argos. -[FIXED] -Option ShowSharePermission no longer appear in separate file configuration menu. -[ADD] -More crédits system and neo file score system (Neomule credits system by default. -[ADD] -SESSIONMAXTIME added in ZZ Uploading code " I don't like to see client uploaded at 0.1ko/s during 6hr...on an upload slot"
-[IMPORTANT NOTE] -Own Sion preferences.ini and Categories.ini is now used, new name is "SionPrefs.ini" and *"Sioncat.ini". You have now any trouble with preference when you share the same folder with another Mod. *With this version all preferences are reset to default value. *If you want to keep your old configuration just rename your preferences and categories ini files. Finally SlotFocus run Fast and Smooth ! -[ADD] - Force kick User at the end completion of chunk (Own implentation Based on timer sheduler for removal). *Now No more extra slot open to push client out when he don't leave after completion. -[CHANGE] -"Auto Max Slot modified" "no more slot open now if you have many shared files"
*and other minor change related on slotfocus. -[ADD] - You can now use Zz multifriendSlot on Upload and Download menus. -[ADD] -Client name Stability fix "Xanatos"
-[FIXED] -Modeless dialog. you can now create collection. -[FIXED] -ARGOS Default setting for ModThief showed a bad default setting. -[FIXED] -Error when peercache sockets close or open. -[FIXED] -A random error when a client ask for a files. -[FIXED] -No longer assert on ClientUDPsocket causing an Upload downtime in some case. -[FIXED] -Completion Status on upload slot work fine again. Client no longer keep the slot open after chunk completion. -[CHANGE] -Filtered or Banned client message banned to logline too. -[ADD] - ChunkDots to PartTraffic. -[FIXED] -minor bug on SlotFocus. -[FIXED] -Missing entry in kad source about kad aux port. -[FIXED] -ShowIncompleteParts menuoption not grayed when InteligentPartSharing disabled. -[ADD] -ULFeedback function from Morph, available on shared file menus. -[ADD] -Option to enable/Disable Custom share permissions. -[FIXED] -USS pinger! now UploadSpeedSense work again. - Also cleaned some useless code. -[FIXED] -Release/share options not appear in filepreference windows. [UPDATED] -HideOs to InteligentPartSharing from neomule, This include HideOs and ShareOnlyTheNeed. [ADD] -SpreadBar NeoPartTraffic style with reset on right click. [ADD] -ShowSharePermission separate for each file separatly "Visible", "Hidden", "Friend only" status. [ADD] - Reask Sources System Manual And Timed, Reask: FQ, NNP. *can be configured for each file seperatly with fileconfiguration. [ADD] -[Slidebar] séparate categories preference "Normal" and "Advanced" preferences List with Set-Up Pages from Plus Mod. -dlp is now a core internal part of the detector engine, and has a bigger flexibility. -Add hash to detector to lechers.dat, not used currently but in case may be useful. -Added missing tests to processmuleinfopacket. -emcrypt clients are now detected as faked client. -Readded anti xs fastask/exploid, should take care of all official bugs and don’t cause false positivs. -Added anti file faker idea by wizard, but own more secure implementation working for tcp and udp. -Added anti udp aggression idea by sivka, own simplified implementation. * Added option to indicate which files you set comments for in the Shared Files tab and in Transfers tab with icons. * Recieved comments are now stored in a comment list for each file, instead of being stored in a single comment per user. As a result, a user can now send a comment for more than one file, and when the user disconnects the comments remain. * Recieved comments can be viewed in the Shared Files tab, and are indicated with an icon. * Comments and ratings for downloading files can be edited directly from the Transfers tab. * New protocol extension allows downloading users to send comments to their sources, so users can now recieve comments for files they have complete. * Multiple dialogs in eMule are now modeless, meaning you can open a dialog, and continue working with eMule behind the dialog with the dialog still open, instead of having to first close the dialog, then work with eMule. * The client details dialog is modeless. You can open one dialog per client. Trying to open the client details twice for the same client will bring the previously opened dialog to the front. * All three file details dialogs, for downloads, search results, and shared files, are modeless. You can open one dialog per file. Trying to open the file details twice for the same file will bring the previously opened dialog to the front. If a file is removed, its dialog will automatically close. * The preferences dialog is now modeless. Clicking on preferences while the preferences dialog is already opened will bring it to the front. * The dialog for browsing the shared files as other users would see them is modeless. Trying to re-open it while it's already open will bring it to the front. [FIXED] -Minor bug in Credits System. [FIXED] -Minor bug Session Average Upload/Slot don't appear in tree stats. [FIXED] -Minor bug in Tweak upload queue. [FIXED] -Minor bug in Upload system. [CHANGED] -HIDEOS: dynamic hide overshares need "Powershared" status to be active. [ADD] -[ReloadSharedOnMissing] - If shared file not found, the shared list reloaded. [FIXED] -Drop FQ sources active status not saved. [FIXED] -minor bug on SmallFilePush. - !! Due to Spreadbars and Share Only The Need, its recommended to delete your "known2_64.met" and "known.met" files in config folder !! - !! If you dont delete both files emule maybe crash at startup !! [FIX] -Major Bug in Upload. [REMOVED] -Possibility to remove SlotFocus. This version use Less memory, less cpu usage and stability improved too. [CHANGE] [FOR TESTING ATM ] -Minor change in SlotFocus Rules. [Loulach] (Change only visible in high Upload Bandwidth). [CHANGE] [FOR TESTING ATM] -Rules When not Using SlotFocus. [Loulach] (Change only visible in high Upload Bandwidth). [CHANGE] -IP adress by default for IPFILTER. [Loulach] (Click reset in update panel for the new one). [FIX] -BugFix in sourceSaver [Loulach]. Recommended a clean install for this release. [ADD] -SUQWTv2 system by Moonlight . When you disabled Slotfocus the datarate slot number according with official emule and cant be changed. Dont miss to Add the DLP and Leechers Files in Config dir (include in zip). -[FIX] Recoded all the part of UPnP Option page. -[ADD] New priority range in shared files . From 1 to 10 with linear weight. With autopriority in normal mode and powareshare too. Gefällt mir sehr gut der Mod. Sehr schnell vorallem. 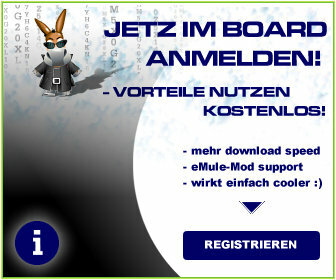 Wo muss sich die mediainfo.dll befinden in emule- Ordner oder in Config Ordner? Danke für den Tip aalerich, aber ich bin auch nicht ganz dumm, das ist mir natürlich auch eingefallen. Habs dann so gemacht und emule neu gestartet, trotzdem hab ich keine Video-details. In den Einstellungen hab ich nichts gefunden. Wieso kann mir denn niemand helfen? Wo findet man diesen Modder, hier scheint er nicht zu sein? Die mediainfo.dll muss ins eMule-Hauptverzeichnis. Nach einem eMule Neustart solltest du in den Details einer Datei den Tab "Media Info" finden. Wenn der Tab da ist aber nichts angezeigt wird, dann liegt es sicherlich daran, dass die spezielle Datei ein Format hat bei dem nichts ausgelesen werden kann (evtl. sicherstellen dass du die neueste version der DLL hast). Was aber hat das konkret mit diesem MOD zu tun?